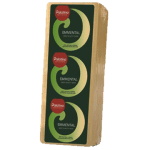 Palatina is Ornua’s specialist foodservice brand which offers a range of world-class dairy products for foodservice professionals around the world. Our vision is to become the preferred supplier of branded, value-added foodservice solutions to the out-of-home market. 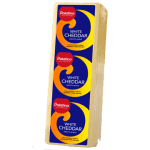 Palatina products, including cheddar and mozzarella, consistently deliver superior functional performance and taste. It offers sustainable production using the very latest technology, customised innovation, global market expertise and total transparency across all manufacturing sites. 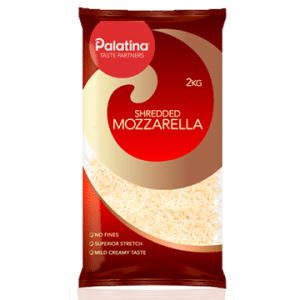 Palatina Mozzarella has a distinctive creamy flavour, and excellent stretch once cooked. Our specialised TCS Technology™ allows the product to stay softer for longer once melted, giving great oven-to-plate consistency. 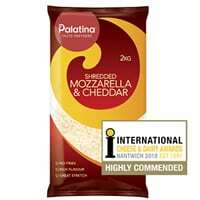 Palatina Mozzarella & Cheddar is a blend of mozzarella and cheddar IQF and provides a rich and creamy flavour. It has an outstanding appearance once cooked which melts to give excellent texture, coverage and stretch. 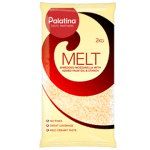 Palatina Melt is the best value product within the range; a specialist product which combines mozzarella and palm oil and offers comparable performance across a range of cooking applications. TCS Technology™ allows the product to deliver evenly distributed mozzarella throughout the product, offering similar benefits to natural mozzarella. 100% natural cheese, Palatina Red Cheddar is made from fresh, pasteurised cow’s milk. It is an extremely versatile product that can be grated, diced and sliced. 100% natural cheese, Palatina White Cheddar is made from fresh, pasteurised cow’s milk. 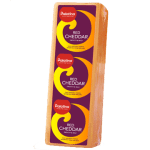 Palatina Cheddar is an extremely versatile product that can be grated, diced and sliced. Palatina Emmental has a smooth rich texture, sweet nutty taste and delicate fragrant aroma. Part-skimmed milk is aged to perfection, forming natural holes giving it a unique look.